The primary function of the Human Resources Division is to attract, retain, promote, and reward dedicated, professional staff members who will make every effort to ensure optimum customer-oriented services to the citizens of Placerville and to its many visitors. The City of Placerville values its employees and strives to provide a safe workplace that assists staff in accomplishing their goals by promoting an environment that is professional, creative, organized and cooperative. The Human Resources Division strives to establish and maintain progressive, equitable and consistent personnel procedures in accordance with federal, state, local, and City rules, regulations, procedures, and requirements. The Personnel program coordinates the City’s employment system through adherence to sound personnel management practices and procedures. Support services are provided to all City departments. Recruitments for vacancies within the City service are advertised on the City’s employment website as well as selected print media. The Human Resources Officer coordinates this program for injured City employees. The Human Resources Officer serves as the liaison between the injured employee, the Claims Administrator, and the employee’s supervisor. Job Opportunities Frequently Asked Questions. How do I find out what jobs are open with the City of Placerville? For information on current jobs with the City of Placerville, you may visit City Hall, 3101 Center Street or e-mail your inquiry to: roconnell@cityofplacerville.org or you can visit the City website here . 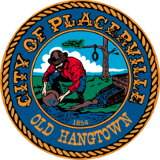 How do I apply for a job with the City of Placerville? If I submit a resume, do I still need to complete the City of Placerville application form? Yes. A formal City application is required to be completed. A separate application form is required for each job interested in. Resumes may be attached to the completed application. Will my application be kept on file? Applications will be kept on file for one year. Is there anything else I need to submit besides the City application? It depends on the position. The job announcement will describe the application requirements. We may require a supplemental questionnaire for a particular job or a certificate of completion from a Police Officer Standards & Training (POST) academy for an entry level police officer applicant. A City of Placerville Employment Application is required for each position applied for unless otherwise stated on the job announcement. The online application requires the Adobe Acrobat Reader. This form is located at the bottom of this page. The City of Placerville employment process complies with the letter and spirit of both the Equal Employment Opportunity (EEO) and Americans with Disabilities Act (ADA) laws. Please use the e-mail address at the top of this page or call the number above to advise the Human Resources Division of any reasonable accommodation you need in order to participate in the City’s recruitment process.